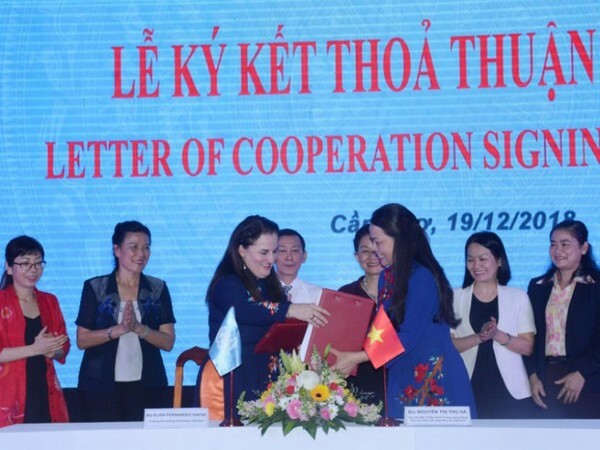 On the morning of December 19th, 2018, VWU President Nguyen Thi Thu Ha and UN Women Viet Nam Head of Office Elisa Fernandez Saenz signed a letter of collaboration for gender equality and women empowerment with the purpose of providing a framework of cooperation and facilitating the collaboration between the two organizations in the areas of common interest. Over the past 15 years, the VWU has had cooperation with UN Women (known as UNIFEM previously) to promote gender equality and empower women through a number of joint activities and projects on increasing women’s participation in leadership and management, preventing violence against women and girls, disaster risk reduction and climate change adaptation, SDGs consultation and review, nutrition and food security and etc. The Letter to Collaboration marks the improvement of the two parties’ cooperation into a strategic partnership.